About this objectA dark brown machine made bottle, three sided with flat bottom. 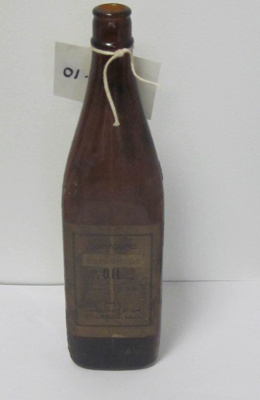 One side reads: Compound Separator Oil...contents 1 1/4 pint...Bottled by David Pratt & Son, 217-221 Mair Street, Ballarat. Second side reads: HUNTERS. Third side reads: This bottle remains the property of Hunter Products Pty Ltd Footscray...This bottle must not be used as a food container. Inscription and MarksHunters. This bottle remains the property of Hunter Products Pty. Ltd., Footscray. This bottle must not be used as a food container.